A big crowd turned out today to commemorate a First World War submariner exactly 100 years after he was awarded the Victoria Cross for a series of daring raids during the Dardanelles campaign. 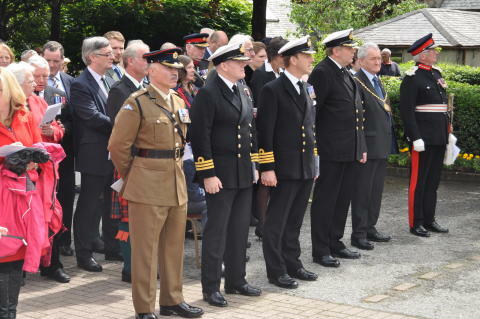 The ceremony – attended by a 50-strong Royal Navy contingent, including several personnel from the submarine branch – attended the ceremony in Admiral Sir Martin Dunbar-Nasmith’s adopted home town of Rothes. The event at the local war memorial included the unveiling of a commemorative paving stone bearing Sir Martin’s name. Today was the 100th anniversary of the official notification of the VC award being published in the London Gazette. Sir Martin – then a young lieutenant commander – was in charge of a submarine which sank several enemy vessels during a three week period in May and June 1915. He was presented with his medal by King George V at Buckingham Palace the following January. He went on to have a distinguished naval career and also served during the Second World War before retiring in 1946. He died in 1965 at the age of 83 and is buried at Elgin cemetery. Among VIPs at today’s ceremony was Sir Martin’s son, the eminent architect Professor Sir James Dunbar-Nasmith, now 88, and other members of the Dunbar-Nasmith family. 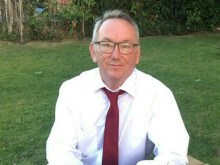 The Royal Navy representatives were led by Commodore Mike Walliker, the Deputy Rear Admiral Submarines based at Faslane, who spoke about Sir Martin’s heroic exploits in the Dardanelles. Pupils from Rothes Primary School were also involved in the ceremony, during which the Lord Lieutenant of Moray, Lt Col Grenville Johnston, also referred to Sir Martin’s heroic wartime actions.